UNITED NATIONS, Jun 6 2017 (IPS) - The oceans’ health is only getting worse and the cycle of decline must be reversed, said representatives at the opening of a high-level UN conference. Approximately 5,000 representatives from governments, civil society, and the private sector from around the world have gathered at the UN for its first ever Ocean Conference, a high-level meeting which aims to address and mobilize action to improve the state of oceans. “The health of our oceans and seas are inextricably linked with the health of our planet and all life on earth,” Secretary General Antonio Guterres told the full General Assembly hall. However, the oceans are under threat as a result of human activity. “We are here on behalf of humanity to restore the sustainability, balance, and respect in our relationship with our primal mother, the source of all life, the ocean,” said President of the 71st Session of the General Assembly Peter Thomson. “The time has come for us to correct our wrongful ways,” he added. Among the pressing issues to be addressed during the conference is marine pollution, and much of this pollution is from plastic. Over 5 trillion pieces of plastic weighing more than 260,000 tons are currently floating in the world’s oceans, a figure that may be an underestimate. More than 80 percent of such plastic waste in oceans comes from land. Because of ocean currents, this trash accumulates in what is known as “ocean garbage patches,” located in virtually every ocean in the world. The largest such patch is the Great Pacific Garbage Patch located between Hawaii and California which is estimated to be around 1 million square kilometers. This has contributed to the massive piles of trash that have washed upon the shores of the isolated and once pristine Henderson Island in the South Pacific. A recent study found that the UNESCO world heritage site is covered with over 38 million pieces of trash, making it the most densely polluted place in the world. Researchers found discarded fishing nets, toy soldiers, and hardhats. “It is inexcusable that humanity tips the equivalent of a large garbage truck of plastic into the ocean every minute of every day. We have unleashed a plague of plastic upon the ocean that is defiling nature in so many tragic ways,” Thomson told conference attendees. And plastic that ends up in the ocean does not solely float harmlessly, but rather have real, long-term implications on animal and human health. Animals, which often find themselves entangled in trash, have also been seen to be ingesting plastic with deadly consequences. In a dialogue on marine pollution on the first day of the conference, Norwegian Minister of Climate Vidar Helgesen pointed to the case of a goose-beaked whale which beached on Norway’s cost earlier this year and was found with nothing but 30 plastic bags in its stomach. Plastics also release toxins when ingested which have found to be damaging the reproductive health of many fish species. Pacific Regional Environment Program (SPREP)’s Director General Kosi Latu noted that plastic was found in 97 percent of fish species studied in the Pacific alone. WEF predicts there could be more plastic than fish in the ocean by 2050 if such trends in ocean pollution continue. Evidence also shows that people are consuming plastics by eating seafood. After purchasing fish from markets in Indonesia and the U.S., researchers found that 1 in 4 fish had plastic in their guts. European researchers estimated that Europeans could be eating 11,000 microplastics every year through seafood. Though the impacts are still uncertain, studies have shown that plastic ingested by humans could be toxic and can increase the risk of health problems such as cancer. Representatives have therefore urged for action to prevent and reduce marine pollution during the conference. Already, countries have outlined commitments to combat the issue. Indonesia has vowed to reduce 70 percent of its marine litter by 2025 while Thailand has established a pollution management plan that comprises of encouraging eco-friendly substitute for plastic materials and implementing a 3Rs strategy of reduce, reuse, and recycle. The lack of strong policies and infrastructure on waste management have largely contributed to ocean pollution. For instance, only 14 percent of plastic packaging is collected for recycling globally, allowing millions of tons of plastic to end up in landfills and oceans each year. “Without effective recycling, I don’t think we will be able to solve the problem,” said Latu. The Ocean Conservancy also found that Indonesia and Thailand are among the top five plastic-polluting nations in the world. Other countries such as Austria have committed to reducing plastic bag use while Sweden introduced a ban on plastic microbeads in cosmetics. More than 600 commitments have been received. Civil society groups have also promised to take action including the Dutch foundation Ocean Cleanup which has developed a cost-effective net system that could clean up 50 percent of the Great Pacific Garbage Patch in five years. Though there is no one size fits all solution, conference participants agree on one thing: we must act now if we want a secure future on this planet. “This is the year that we cease to steal from the future of our grandchildren,” said Thomson. The globally agreed 2030 Agenda for Sustainable Development includes goal 14 which stresses the need to conserve and sustainably use the oceans, seas, and marine resources for sustainable development. Within the goal is a target to prevent and significantly reduce marine pollution of all kinds by 2025. 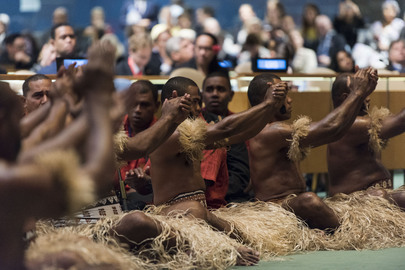 The Ocean Conference, organised by Sweden and Fiji from 5-9 June at the UN Headquarters in New York, will address ways to implement goal 14 and its targets.